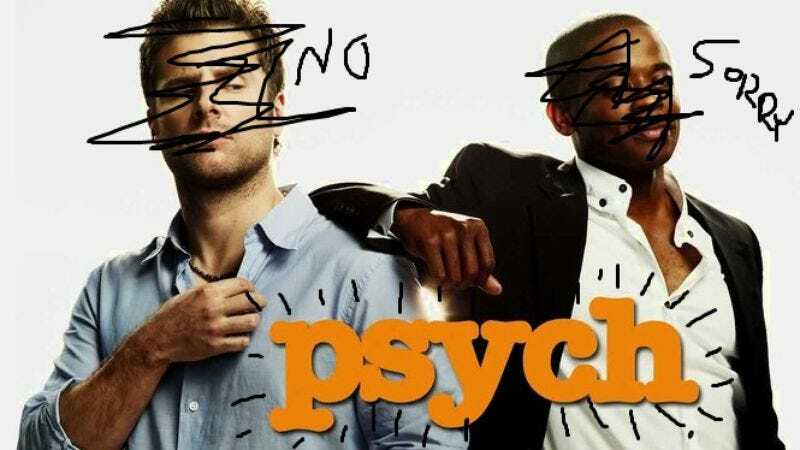 Briefly raising and then immediately dashing the hopes of TV fans with a taste for fake psychics, banter, and increasingly elaborate genre pastiches, Sony has announced that it’s making a movie called Psych, but it’s not the Psych you’re thinking of. This Psych is a comedy about a psychiatrist who changes his own life by performing unorthodox therapies on an institutionalized patient, a premise so full of laughs that no disquieting moral doubts could ever possibly be raised. Could those therapies involve pretending to be psychic and solving crimes with a crew of wacky detectives? Almost certainly not, because that was a different Psych. We can’t emphasize that enough. The script for the new Psych was written by Aaron Buchsbaum and Teddy Riley, two former Hollywood assistants who made a name for themselves by selling their action comedy script El Tigre to Sony. We’re just hoping Psych 2.0 (which is in no way associated with the TV show Psych) is a success so that Buchsbaum and Riley will continue to pen scripts with names that tease the USA Original faithful. Monk, for instance, a screwball Will Ferrell comedy about a hopelessly clumsy Benedictine. Burn Notice, an arson investigator’s tale. And, of course there’s Duckman, about a guy constantly having to avoid head-level flying objects.